The monopoly game is a game of chance, since the properties on the board that you land on, depend on the number that come up when you roll a pair of dice. However their is also much strategy involved, as you have to decide which properties to buy when you land on them, and when and how much to improve them by adding houses and hotels. In the early rounds move as much as you can and buy as much as you can. Favor buying color groups that have three properties, not two. These will be landed on more often by opponents who must pay you rent. The best color group is orange. Red, and yellow are also good. These color groups lay beyond jail, and get landed on the most often. Quickly build to get to three houses as quickly as possible. The rent increases significantly going from two to three houses. There is not a lot of added rental income by adding a fourth house or a hotel, so add three house to more properties before adding a fourth house or hotel to others. However you might add a fourth house, but don't add hotels. The idea here is to tie up as many houses as you can, creating a shortage of houses. Then opponents can't add houses or hotels to improve their properties. There are a limited number of houses (32) in the game. 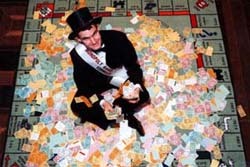 Buy Railroads - In 1999 Matt Gissel, of St. Albans VT, won the National Monopoly Game Championship in Las Vegas. One of Matt's strategies was to secure all four railroads. He used the cash they generated to improve his properties. That is Matt, sitting on a pile of Monopoly money in the picture. If you get into jail early in the game get out at your first opportunity so as to move more and buy more. If you get in jail later in the game, stay there as long as you can to avoid moving and landing on opponents properties, where you will have to pay rent. Increase your negotiating skills. Making good trades is an important aspect of the monopoly game. Those with good negotiating skills make the best trades. You can find out more about Monopoly Board Game strategy from Phillip Orbanes's book: The Monopoly Companion - The Players Guide.